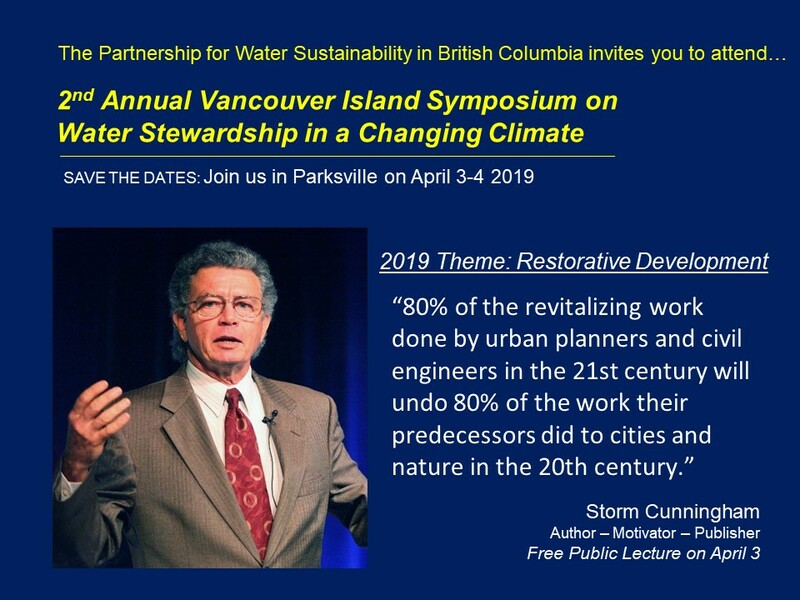 In recent years, the Vancouver Sun newspaper has published a series of op-ed articles provided by the Partnership for Water Sustainability in British Columbia. The over-arching purpose of these ongoing submissions is to mainstream new ideas and/or ways of thinking about water and land differently. October 2016 – Communities Urged to Integrate “Water Balance Solutions” into Land Use Decisions – A new way of thinking about municipal infrastructure has the attention of the local government world. Simply put, natural watershed systems are infrastructure assets – manage and protect them as such! January 2017 – Blue Ecology – interweaving the best threads of Indigenous and Western Science to make water-first decisions – What we are essentially talking about is reconciliation: going back to the headwaters of where we got our relationships with water and with one another wrong; and then starting back down the river of time — this time together. October 2017 – Blue Ecology – A Realignment of the Water Story: We really must move beyond ‘shock and yawn’– Climate change has happened more quickly than predicted. The real story is the accelerating rate of change, especially since extreme events create their own weather. October 2017 – The Fraser River, Climate Change and Food Security: Increase irrigated land area by 50% to attain food security in BC – Home to two-thirds of British Columbians, the mighty Fraser River is the lifeblood of a vast watershed that stretches from the Rockies to the Pacific. The lower Fraser Valley, one of the most productive agricultural regions in Canada, is vital to B.C.’s long-term food security. June 2018 – Celebrating a Decade of Living Water Smart in B.C. – Where To From Here? – B.C. communities can adapt to the new normal. They can create a water-resilient future where flood and drought risks are reduced. We have tools and experience to “get it right”. Through collaboration and commitment, together let’s make it happen — sooner, not later! September 2018 – Restorative Development: Hydrology is the Engine that Powers Ecological Services – The process to adopt, change or evolve accepted practices is painfully slow. Reinvigoration of the provincial oversight function is essential to help local governments be effective in moving B.C. toward restorative land development. Pre-Announcement. Details Coming Soon. Stay Tuned.